Soul Moxie...The Courage to Live and Lead with Soul. Here's the simple truth. If you want a life and career that's fulfilling, complete with contribution that matters (without getting burned out), you must become a master of making a RIGHT decision every time. Now I don't mean right or wrong ethically or societally. I mean right for YOU. Just as no one can tell you your path, no one knows what is right for you besides you. Harnessing the power of your intuition. Nothing has as potent an impact as understanding and using intuition on a daily basis. I've hidden my passion for intuition for years because I was afraid people would judge that the idea was “out there.” But you know what? The more I've shared what I know about intuition, the more CEO's, CFO's, Moms, teachers, marketing experts, and directors have enthusiastically agreed that they know exactly what I'm talking about! They too swear that intuition is an invaluable game-changing tool when used consistently. Intuition appears all the time in everyday life. It’s that flash of insight about NOT attending that event you feel like you "should" go to. (But you ignore the insight, go to the event anyway and feel completely wiped out afterwards). Or it’s when you discover a product that just "feels" perfect so you bring it to your store and it sells like hotcakes. Intuition is the fast track to clarity, to enhancing a sense of freedom, ease and fulfillment. Intuition is the key to a level of success you've never experienced before-- because when harnessed and mastered, it is reliable and is never at your expense. Did you know that each person has their own unique Intuitive Style? 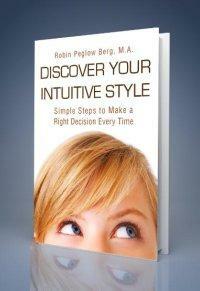 Your Intuitive Style is how you perceive the world and gather invaluable information. It’s my passion and gift to help you discover yours. When we're unplugged from our Intuitive Style it's like we're trying to live inside someone else's rhythm. The rhythm of the world can be intense and draining if we’re not paying attention. This often dampens our intuition, causing us to feel a bit lost and less-than-100% confident --essentially we’ve lost our compass! You push yourself “just a couple more hours” until you’re totally depleted of energy. You miss great opportunities that in the moment seem “irrational,” yet in hindsight were brilliant. Luckily, being that you are a conscious, extraordinary woman, you can choose to hit the RESET button any time you choose—to tune to a different rhythm. Your Own. And very simply, within your own rhythm lies the wellspring of your Intuitive Style. It is only once you’ve found your own rhythm and clarified your unique Intuitive Style that you can truly lead others--actualizing your full potential and making the kind of contributions that really matter to you. Success gets completely re-defined. And you get to experience the ease of being on your Soul Path in life and career. It’s mind-bendingly fabulous and like a fine blend of peace and confidence. Click here to find out what it takes to discover your rhythm and harness your Intuitive Style. "Yes-- I am feeling fueled! I am going to get trained this fall to mentor a young woman through the college application and acceptance process and will mentor this woman for about 18 months. I also launched a major short term fundraising goal and the group exceeded the goal! It’s been nice to shift my focus, because it seems to be pulling forward my success in other activities as well. So thank you! You’ve been a huge help in getting me back on track toward focusing energy in the right direction. It really turns on the sparkle throughout my life. Receive the first Chapter of my new book for FREEE! Simply enter your email below to receive the first chapter of Discover Your Intuitive Style: Simple Steps to Make a Right Decision Every Time. You'll also receive bi-weekly tips, articles and strategies to cultivate the courage to live the life you really want! Are you a driven woman who's a match for a Soul Moxie program? You are very successful in your career and are now ready to set and achieve a big stretch goal- i.e. launch a new initiative, create a non-profit, write a book, create a women's collaborative. You know that when you have a mentor for clarity, structure and support, you are unstoppable. You're feeling ready to work with not just a life coach, but a Success and Fulfillment Coach, who offers a personalized, collaborative approach to you designing the kind of life and leadership you want! You crave peace, being happy, and having freedom. I want to take a moment to express my sincere gratitude to the amazing people who were my "team" to create this new website, content, and design. Without them I could not have completed my "10 Years-in-Business" makeover! You are all masters in your fields, and it is truly a gift to work with each of you!